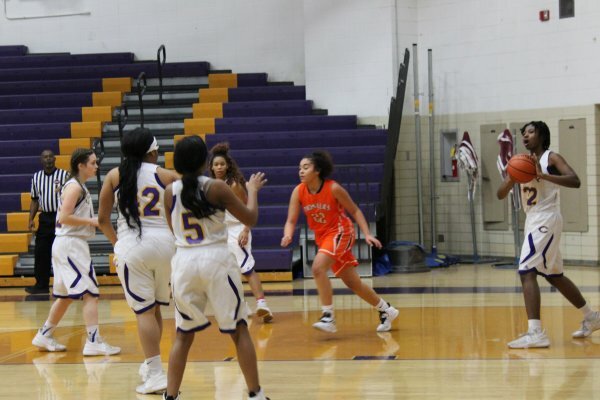 LADY POUNDERS BASKETBALL TEAM LOOKS BACK ON THIS SEASON’S ACHIEVEMENTS -- Central’s girls basketball teammates work together to score a basket. Central High School’s Lady Pounders went through many ups and downs this season. With six wins and four more games to go, the team is very proud of their accomplishments this season. According to many teammates, Ja’Nya West is Central’s star player. 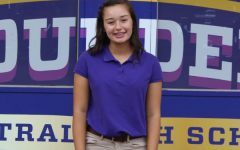 West is a junior who has been playing basketball since she was seven years old. She is one of the team captains as well as the leading scorer. 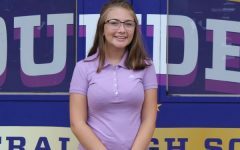 West admitted that while she still needs to work on some things, she is proud of her improvement this year, and plans to continue her basketball career throughout college. “I think the last game was a major highlight because we all came together as a team and started playing very hard toward the end. I am proud of how far I have come this year because I have learned new things and I have been trying to incorporate them into the game. But, I feel as if I still have some work that I need to do,” voiced West. Rick May has been coaching all nine members of the girls basketball team. With 13 games completed so far, he believes that the team is still a work in progress, but they have been successful in maintaining their overall progression as a team. “I am very proud of how hard the girls are working. The team has at times grown, but we seem to take one step forward then two steps back. Although the season is not over yet, I think we are still learning how to win,” explained May. Central High School’s Lady Pounders have had a considerably good season according to students and teachers. The members of the team have worked hard to get where they currently stand as players, teammates, and friends. Central hopes to see this status the players have built for themselves upheld in the seasons to come.